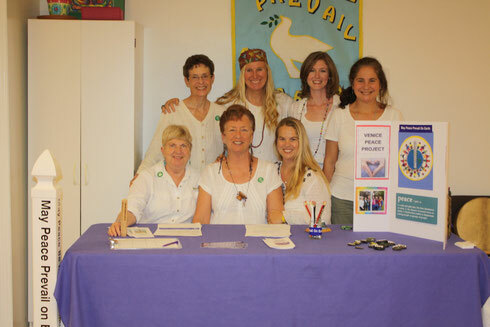 Venice Peace Project (VPP) began in November 7, 2013 as a result of a desire of citizens in the Venice community to live and work in a more peaceful environment. Our vision is “Peace in our hearts, peace in our community, and peace in our world.” Our mission is “…to promote and inspire peace in our hearts, peace in our community, and peace on earth through outreach to schools, organizations, and individuals through talks, books, movies, plays, music, documentaries, poetry, peace poles and other symbols of peace.. We accomplish our vision and mission through education, activities that stimulate conversations about peace, and placement of symbols of peace, Peace Poles, throughout the city and the county. To date, VPP has been involved in the placement of 17 Peace Poles in our community, held over 60 events in the community, consisting of peace movies, workshops, meditations, annual celebrations of International Peace Day, and special children's art programs to teach about peace. 9.22.2012 - 10.9.2012 Ali and Donna to Bhutan - inspiration o what can be in myriad forms. 11.7.2013 – First meeting of Venice Peace Project! 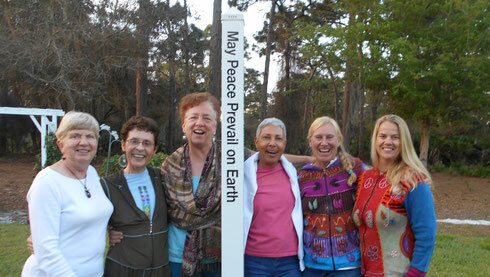 Venice Peace Project - we are 6!